If you're looking for a great (and cheap!) hotel in Las Vegas, CheapTickets is the best place to find them. We offer deals on the best 387 hotels throughout Las Vegas. No matter what you're looking for, we have options for you. Grab great rates on the 107 affordable 3-star hotels that are easy on the wallet without sacrificing comfort. Looking for more luxury? Try one of the 62, 4-star hotel accommodations in Las Vegas. No matter your budget needs, we've pulled out all the stops to make sure you have plenty of vacation options. Maybe you prefer to search for your hotel deals based on what each hotel offers? For example, let's say you just want to find a hotel or resort that has a pool to cool off in after a long day exploring Las Vegas. 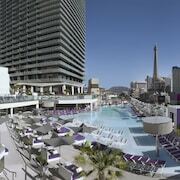 Scroll down to choose from the 208 hotels in Las Vegas that has a pool for guests. Or search for deals on Las Vegas hotels offering free wifi or breakfast, non-smoking rooms, and more! CheapTickets is here to be your personal travel agent for your next trip to Las Vegas. Get booking today! What hotels in Las Vegas offer free wifi access? Are there deals on Las Vegas hotels offering free breakfast? Yes! The only thing better than finding a great deal on a cheap hotel in Las Vegas is finding one that offers free breakfast. Grab some eggs, a waffle, or some healthy oatmeal before a day full of exploring Las Vegas and all that it has to offer. Below are just some of the many hotels that offer free breakfast in Las Vegas. Harrah's Hotel and Casino Las Vegas is a 3.50 star rated hotel property in Las Vegas that offers free breakfast. El Cortez Hotel and Casino is a 3.00 star rated hotel property in Las Vegas that offers free breakfast. Silver Sevens Hotel & Casino is a 3.00 star rated hotel property in Las Vegas that offers free breakfast. Mirage Resort & Casino is a 4.00 star rated hotel property in Las Vegas that offers free breakfast. What about deals on pet-friendly hotels in Las Vegas? Las Vegas is a great place to get outside and explore with your pets in tow so don't leave your furry friends behind. Below you'll find great deals on hotels in Las Vegas that allow pets. Don't forget to bring plenty of treats! Gold Coast Hotel and Casino is a popular, pet-friendly, 3.00 star hotel in Las Vegas. Bally's Las Vegas - Hotel & Casino is a popular, pet-friendly, 4.00 star hotel in Las Vegas. The Signature at MGM Grand is a popular, pet-friendly, 4.50 star hotel in Las Vegas. Platinum Hotel is a popular, pet-friendly, 4.00 star hotel in Las Vegas. Any good rates on Las Vegas hotels with restaurants? Absolutely. Don't want to deal with planning our all your meals on your trip to Las Vegas? We don't blame you. Keep the hangry away by staying in one of the 127 hotels that have restaurants. With a room at one of these spots, all it takes to get a good meal is hopping in the elevator. Check out some of the most popular hotels in Las Vegas that have restaurants below. Book Circus Circus Hotel- Casino & Theme ParkCircus Circus Hotel- Casino & Theme Park is a 3.00 star hotel and has one or more restaurant options. Book The Palms Casino ResortThe Palms Casino Resort is a 4.00 star hotel and has one or more restaurant options. Book New York-New York Hotel & CasinoNew York-New York Hotel & Casino is a 4.00 star hotel and has one or more restaurant options. Book Alexis Park All Suite ResortAlexis Park All Suite Resort is a 3.00 star hotel and has one or more restaurant options. What are the cheapest hotels in Las Vegas with pools? What's better after a long day exploring Las Vegas then a relaxing dip in a pool? Finding the Las Vegas hotel you need for a bargain! Cool off and unwind at one of our 208 Las Vegas hotels with a pool. Browse some of the top deals on these hotels and resorts with pools in Las Vegas below, but be warned: You may not want to check out! Stratosphere Hotel- Casino & Tower- BW Premier Collection has a pool and a 3.50 star rating. Rio All-Suite Hotel & Casino has a pool and a 4.00 star rating. Cancun Resort by Diamond Resorts has a pool and a 3.00 star rating. 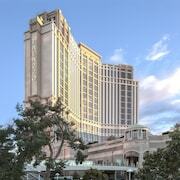 Caesars Palace - Resort & Casino has a pool and a 4.50 star rating. What hotels in Las Vegas offer parking for guests? Once you've made your way to Las Vegas, the last thing you want to deal with is finding parking close to your hotel. Avoid the hassle of parking around the block and carrying your luggage all the way to the lobby by booking one of our hotels with parking. Check out deals on some of the 207 hotels in Las Vegas that offer parking for guests. Palms Place Hotel and Spa at the Palms Las Vegas This hotel has a 4.50-star rating. Hilton Grand Vacations on the Las Vegas Strip This hotel has a 3.50-star rating. Park MGM Las Vegas This hotel has a 4.00-star rating. Polo Towers by Diamond Resorts This hotel has a 3.50-star rating. Do Las Vegas hotels offer 24-hour concierge services? When you're on vacation, things don't always go according to plan. Travel with peace of mind when you book one of our 84 hotels in Las Vegas with 24-hour concierge service. That way you know help is always phone call or elevator ride away. Try Downtown Grand Las Vegas. It's a 3.50 star rated hotel in Las Vegas that offers concierge services 24 hours a day. Try Mandalay Bay Resort And Casino. It's a 4.00 star rated hotel in Las Vegas that offers concierge services 24 hours a day. Try Palace Station Hotel and Casino. 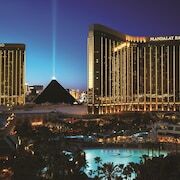 It's a 3.00 star rated hotel in Las Vegas that offers concierge services 24 hours a day. Try Hard Rock Hotel & Casino. It's a 4.00 star rated hotel in Las Vegas that offers concierge services 24 hours a day. What about low rates on non-smoking hotels in Las Vegas? 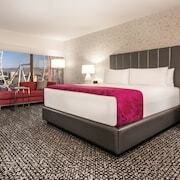 Flamingo Las Vegas - Hotel & Casino This hotel has a 3.50-star rating. Planet Hollywood Resort & Casino This hotel has a 4.00-star rating. Alexis Park All Suite Resort This hotel has a 3.00-star rating. Marriott's Grand Chateau This hotel has a 3.50-star rating. 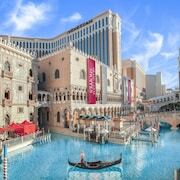 What are the cheapest Las Vegas 3-star hotel deals? Our 3-star hotels bring you quality accommodations at a lower price point for the perfect, budget-friendly vacation in Las Vegas. With 107 3-star hotels throughout Las Vegas to choose from, you still have options. Browse our selection below. Stratosphere Hotel- Casino & Tower- BW Premier Collection. The Stratosphere Tower observation deck features 360-degree views of Las Vegas to the Strip. The gateway between vintage Vegas and Strip glitz, the hotel is close to shopping, the monorail and the Convention Center. Excalibur Hotel Casino. Located at the southern end of the Las Vegas Strip and close to McCarran Airport, this castle-shaped hotel features royal accommodations and a traditional action-packed medieval dinner show. Luxor Hotel and Casino. 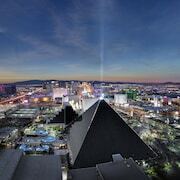 With 2 22-story towers and an eye-catching 30-story pyramid topped by a powerful light beam, this resort is 2 miles from McCarran International Airport in Las Vegas. Circus Circus Hotel- Casino & Theme Park. Iconic hotel located on the Las Vegas strip, Circus Circus is close to shopping, the Las Vegas Convention Center and downtown Las Vegas. What are the best deals on 4-Star Hotels in Las Vegas? Las Vegas is full of hotels and it can be hard to narrow down where you really want to stay. Luckily, we've done that hard work for you be narrowing you from 387 hotels throughout Las Vegas, to the 62 4-star hotels in Las Vegas. Our 4-star hotels in Las Vegas are exactly what you need for your next family trip, romantic weekend, or solo getaway. Check out our most popular deals below. MGM Grand Hotel & Casino: Located on the southern end of the famous Las Vegas Strip, this hotel is close to McCarran International Airport, Crystals at City Center, and the University of Nevada, Las Vegas. TI - Treasure Island Hotel and Casino: Treasure Island - TI Hotel & Casino is connected to the Fashion Show shopping mall by bridge as well as The Mirage by tram, and within easy walking distance of Wynn/Encore, the Sands Expo, and Venetian/Palazzo. Park MGM Las Vegas: Centrally located in the heart of the action, this Las Vegas Strip hotel features an all-encompassing seasonal pool scene with a lagoon, lazy river, and wave pool. Mandalay Bay Resort And Casino: 3 miles from the airport, the 43-story Mandalay Bay Resort sits on 60 acres at the south end of the Strip; a complimentary monorail connects it to the Luxor and Excalibur hotels. What are the best activities to do in Las Vegas? Loving You Wedding Package at Graceland Wedding Chapel: Starting at just $178 per person. Lets Get Hitched Wedding Package at Graceland Wedding Chapel: Starting at just $108 per person. Hollywood Day Tour from Las Vegas: Starting at just $199 per person. TAO Night Club All-Access Pass: Starting at just $20 per person. We had a great time at Caesars. Will definitely return! Room was small but clean. Pillows were not comfortable at all. Pillows were lumpy and sunk in. I had a really bad neck pain the next morning.